LOS ANGELES -- By the time USC reached the regular-season finale against Notre Dame last year, it was already fair to classify the Trojans' season as a disaster. They finished the Pac-12 season with a losing record and were in need of a win against the undefeated Irish to avoid an overall losing record for the first time since 2000. It didn't happen. Notre Dame erased a 10-7 halftime deficit and won 24-17 to secure a spot in the College Football Playoff, leaving USC in a state of disrepair. "It is my firm belief that we have a good team returning next year and a solid foundation in place, and that Clay Helton is a good coach," Swann said. "Let me be clear to everyone, our players, our recruits and our fans. Clay Helton is our head coach and he will continue to be our head coach." Whether USC's relatively good showing against the Irish ultimately factored into Swann's decision is unclear, but it did help convince Helton the type of direction he wanted to take the program's offense. 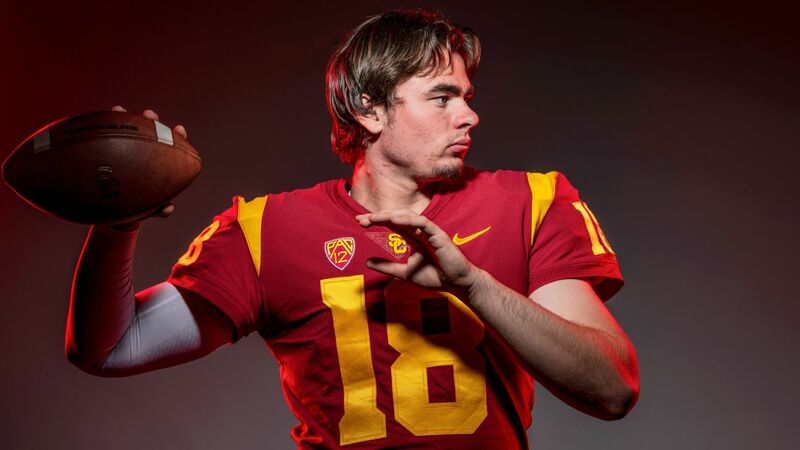 In the first half, true freshman quarterback JT Daniels completed 26 of 31 passes for 244 yards and, after a mostly mediocre season, looked every bit the part of the big-time recruit he was billed as when he arrived. The more pass-heavy approach gave talented receivers Tyler Vaughns, Amon-Ra St. Brown and Michael Pittmanthe to opportunity to be more impactful, and they took advantage by combining for 29 catches for 325 yards in the game. With all three coming back, it was easy to envision how the offense could evolve under the right tutelage. "Just as a play-caller, when you look up and you had almost 260 yards of passing game in one half," Helton said. "You're like, 'OK, this group could be truly special.' One of the things was I needed to step back, I wanted to bring a great passing-game mind in that could continue it, and look what we found in [new offensive coordinator Graham Harrell]. "But the Notre Dame game was a huge reason why we went down this road." Harrell's hiring made a lot of sense. If Mike Leach can field a consistent winner in the Pac-12 at Washington State using his version of the Air Raid, there's no reason to believe this type of system can't work for the Trojans. The more important question, obviously, is will it work? And that's where there remains more than a little skepticism. While Daniels showed flashes against Notre Dame, his level of play over the course of the season didn't put him in a place to be considered the unquestioned starter in 2019 -- especially with a new offense to learn. Like he did in training camp last year, he has spent the first two-thirds of USC's spring practice competing with Jack Sears and Matt Fink, plus early enrollee Kedon Slovis. "They all understood that with a new system comes a new competition," Helton said. The coaching staff and quarterbacks maintain there has been a balanced distribution of reps for all four guys to teach them the new offense, but at this point it still seems unlikely Daniels will get beat out. Sears, who played well in a start last season against Arizona State when Daniels was hurt, figured to have the best shot at unseating Daniels -- and maybe still does -- but there has been nothing to indicate what he has shown over the first 10 spring practices has significantly helped his standing. Then again, it's spring practice and it's usually a bad idea for outsiders to try to glean much insight from performances in controlled settings largely devoid of the context necessary to make a proper evaluation. For Sears, that counts double because his ability to extend plays with his athleticism isn't showcased the same way in practice -- where he's off limits to tacklers -- as it is in games. It was similar for Sam Darnold, whom Sears succeeded at San Clemente High, when Darnold was competing with Max Browne at the start of his USC career. In practice, Darnold and Browne performed similarly -- it's partially why Browne won the job initially -- but Darnold's playmaking ability outside the confines of the offense made him much more effective once he took over. "[Harrell] likes a quarterback that makes plays and finds completions at the end of the day," Sears said. "He wants us to make plays that we can replicate over and over again. "So the scramble drill plays, when those kind of breakdowns happen. Yeah, it's good to be able to showcase [the athleticism], but he wants us to perform the offense the way it's drawn up and execute at a high level." For Sears, the stakes are clear. Because he has the same amount of eligibility remaining as Daniels, if he doesn't win the job this time, it's unlikely he will ever be the full-time starter at USC. In theory, Daniels could leave early after the 2020 season, opening the door for Sears to get another shot at winning the job as a fifth-year senior, but it will be a while before that specific possibility requires further exploration. "[Transferring] hasn't really crossed my mind at this point," Sears said. "Kind of when I heard we were getting a new offense, a new coordinator and new perspective, I was excited to focus on being the starting quarterback. That's the only thing on my mind right now." The approach makes sense, but the reality in college football is that highly recruited quarterbacks rarely stick around at a school once it's clear there will be limited opportunities to play. While USC's spring football showcase event on Saturday will be televised by the Pac-12 Network and feature at least some scrimmaging, it won't be in the mold of a traditional spring game and won't carry added importance for the quarterback competition like might have been the case in a more traditional game-like setting. Of the four quarterbacks in camp, the one who has generated the most positive buzz is Slovis. Not because of how he stacks up with the others, but because of how quickly he has taken to Harrell's offense. ESPN gave Slovis a four-star grade during his recruitment, but other blue blood programs didn't pursue him. "I think having a new system kind of evens out the playing field for him because it's not like the other guys have been learning it for three years and he's in Year 1," Harrell said. "I think a kid coming in straight out of high school and performing at a high level like he is, it kind of surprised me. But again, I think he's playing on a much more even playing field than most kids coming because it's new for everybody."